This Sunday, Rob and I had one of those days where we intended to get 50,000 house-related errands done and ended up staying home in our pajamas instead. Not that we were unproductive: I worked on various writing projects at the dining room table and he worked on his art back in the studio. 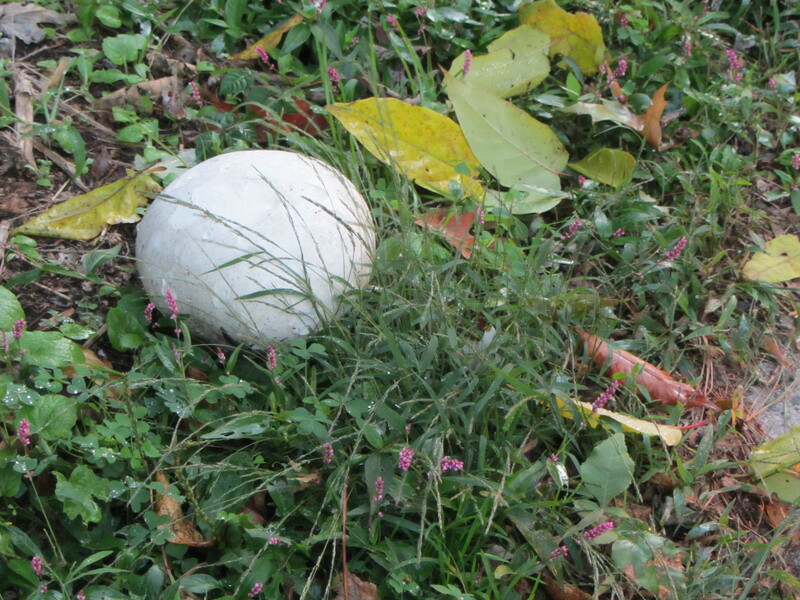 Upon closer inspection, we wondered if it was a moon, or a meteorite, or (I practically jumped up and down)…A MUSHROOM? Of course, I immediately ran home to get my camera. I had just been lamenting the fact that this year hadn’t been very mushroom-y around these parts. Here it was the last day of September, and I hadn’t had a good mushroom sighting since May (which inspired me to write this very bad but well-intended poetry.) Previously, it seemed like mushrooms were popping up everywhere. I don’t claim to know a whole lot about fungi. I don’t go out of my way to hunt for them. Really, I’m just an enthusiast: I let them come to me and get positively giddy when they do. We puzzled over this strange specimen. Just a few feet away, there was a similar shape, broken in half. I broke it a bit more with my foot – it sure felt like a mushroom and the insides seemed to have the right consistency. 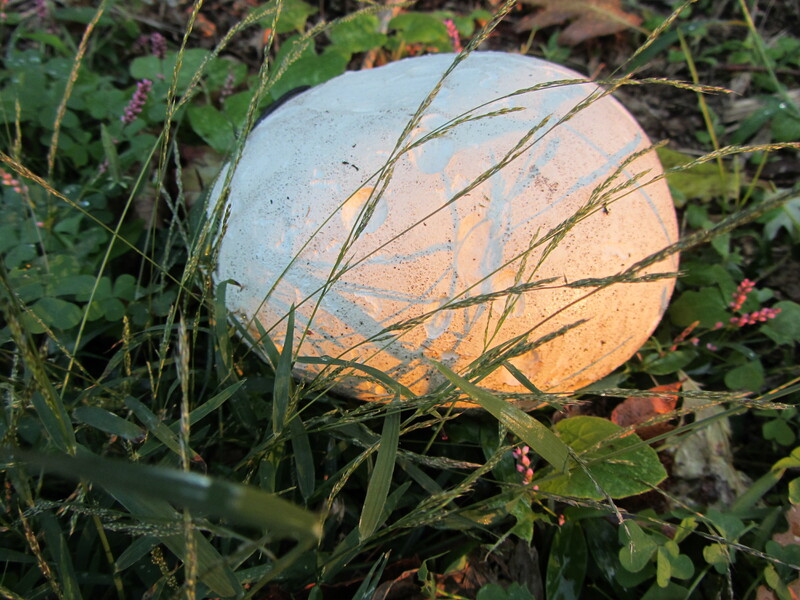 When we got home, Rob googled “huge white round mushroom” and we learned that it is called a Giant Puffball or Calvatia Gigantea. Then we cross-referenced it in my beloved, The Book of Fungi. Turns out these things are edible (no thanks! ), have no stem (what? ), and can become super-huge, the largest recorded one reaching 5 feet in diameter and weighing in at 40 pounds. 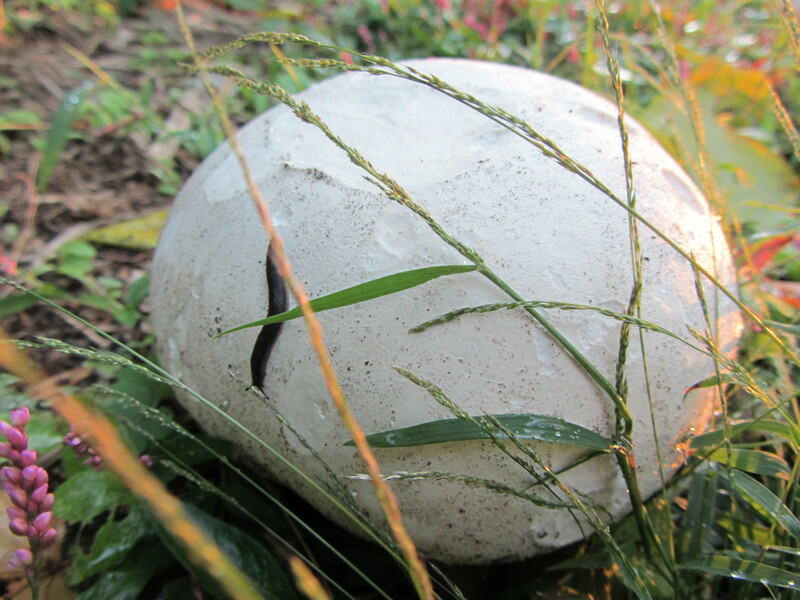 Stumbling upon these weird globes during an evening stroll more than made up for an otherwise shroomless season. It was a perfect “cap” to a creative day. Here’s to creativity, within us all and all around us. Have you ever seen one of these things? If you were to stumble upon one, what would you do: 1. quickly get your camera like I did 2. run away screaming and move out of the neighborhood 3. take a bite? um, whoa! i was totally believing “moon”, but mushroom?! that thing is huge! i have never, ever seen one that size. plus, i love the word “thicket”. makes me want to say it all day long. 5 feet??? That’s totally bizarre! You’re right – they do look kinda space-y. I have to admit, we were totally in awe. And the way the sun was hitting this thing made it positively glow. nature is amazing and surprising – so weird to just see something you have never seen before just pop up in such an everyday situation. I know, I gotta wonder what the people in the cars thought as the passed by and we were scratching our heads going, “Whaaaat?” I felt pretty self-conscious when I ran back for the photo shoot, but I know that’s what you gotta do when you’re a hard-hitting mushroom journalist. Pajama days are the BEST. Although around three or four I start to feel kind of randomly irritable. It never makes any sense to me… it’s like getting agitated after a spa day… weird and illogical. Plus, I am not married to someone who appreciates the finer points of a Sunday worth of silence and solitude… so lucky you. I had to read the sentence about a 40 lb/5 ft mushroom twice. I cannot even imagine such a thing. I know, days like those do prove that there can be too much of a good thing. I probably would have nudged it with my foot then jumped back 10 feet in case it wasn’t a mushroom. 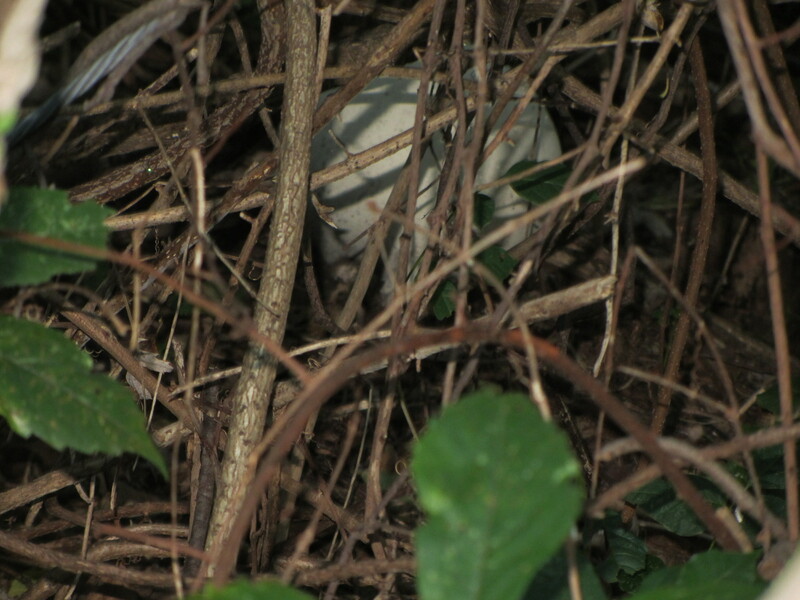 I’ve seen a picked puffball. Never encountered one growing though. No, I wouldn’t eat the one offered. People seem to love them. Just not me. 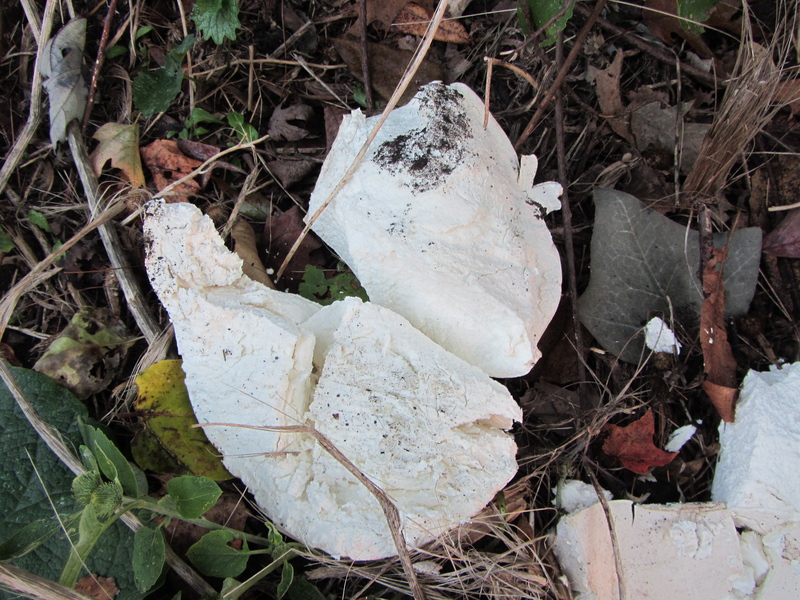 I’d think twice myself – then again, one of these puffballs would feed a lot of people – very economical I suppose. 🙂 Thanks for stopping by! Oh I LOVE days like you had here. When we’re both just chillin’ and enjoying the day, doing things we love, feeling those creative juices. And then you topped it all off with a humongous mushroom that could have been from outer space. It doesn’t get any better than that. We’ve got TONS of them right now in our yard. Not these big suckers… but regular ones with stems. What’s up with all the mushies. I don’t think I ever remember seeing so many of them. They’re super fun though. 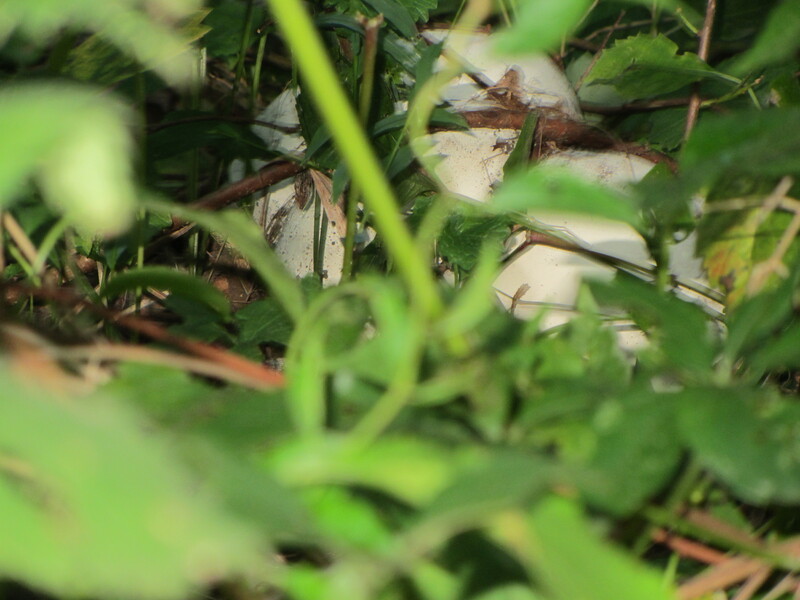 You’re right – it was kind of like a “thicket nest” – the fact that we saw a few others helped us confirm that it was a little mushroom outcropping. I’m pretty sure that’s a dinosaur’s egg. I am fascinated. I never saw a mushroom as big as that! A little wild onion or chive and wild rice and you coulda had yourself one wild mushroom soup. Didn’t know they were edible, those things are huge – a full meal!